The first at the Loop Red Course is 375 yard par 4. The top photo is the view from the first tee, going counter-clockwise (The Red Course) toward the first green. 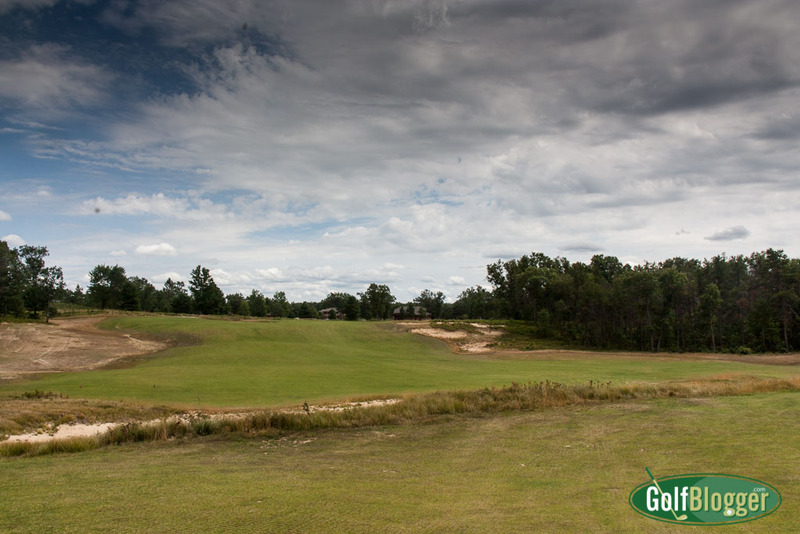 The photo below is the view from the eighteenth tee looking toward the eighteenth green when the course is playing clockwise (The Black Course). The Red first and Black eighteenth share the same fairway (fortunately, play is one direction only each day). The eighteenth green (both clockwise and counter-clockwise — it is the same green) is to the left of the teeing ground in the top photo. The first green (clockwise) is to the right of the teeing ground in the second photo. To further complicate the description, the first green going counter-clockwise is the seventeenth green when the course is running clockwise. So, if you’re playing clockwise, you would finish on the seventeenth green; go a few yards to the left and then you’ll see the view in the second photo. 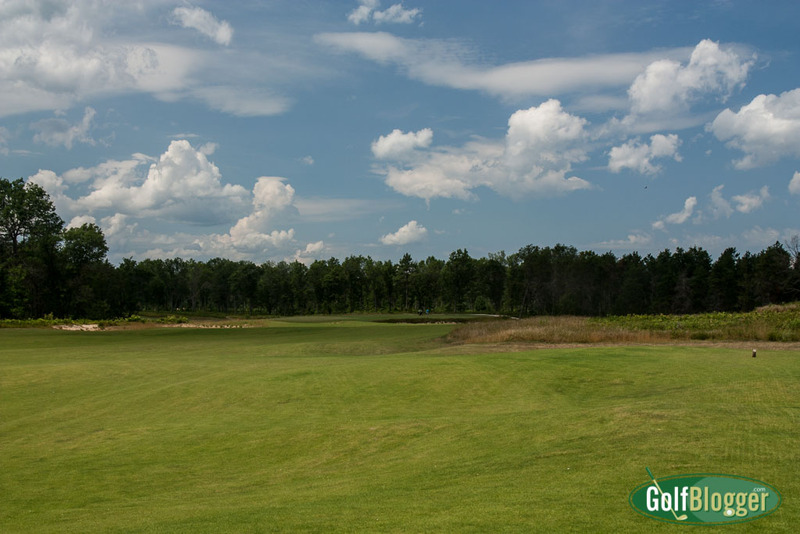 If you’re playing clockwise, you’ll finish on the first green, and if you look to the right, you’ll see the teeing ground for eighteen going counter-clockwise. Tom Doak’s design has very cleverly created two courses that — in spite of shared fareways and greens — play very differently. Visually, much of the course seems the same when playing in either direction. There are lots of wide, undulating fairways, (deliberately) rugged bunkers and Northwoods scrublands along the edges. If you’re looking for visual clues to distinguish holes, The Loop doesn’t offer a lot. The same is true, however, if you take two different parklands courses, two different woodlands layouts, or two different marshy lowlands tracks. I could take two photos from my collection of northern woodlands courses and even having recently played them, most golfers would be hard pressed to tell which belonged to which course. The important thing is that holes play differently, offering different sets of challenges. The Loop does that very neatly.